It’s now well established that PDF is a format of choice to store documents in Document management software. Apart from PDF viewer and Editor, Docsvault also offer a PDF Printer that allows you to import all printable documents from third party applications to Docsvault and convert them to PDF documents. This allows you to save files as PDFs with one click and maintain the look and readability of your documents. Some of the many benefits of converting your documents PDF are: format consistency, search by keywords and compact file sizes to improve the speed of file transfer. Docsvault not only allows you to scan paper documents and convert them to PDF but can also convert all your printable electronic documents such as MS Word, Excel, PowerPoint and web pages to PDF documents. PDF has become a universally accepted format for exchanging documents. Whether you are in legal, medical or production field, you will find dealing with documents easier when they are converted to PDFs. Moreover, this feature comes built-in with Docsvault so there are no additional costs to you. Docsvault also offers PDF editor, if you want to manipulate your PDF documents further. All in all, Docsvault will allow you to create, modify, append, split, and assemble your documents once they are in the PDF format. 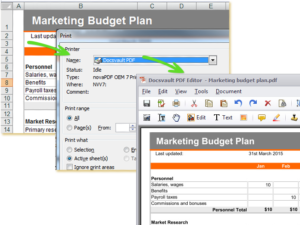 You can create PDF files from any MS Office application like Word, Excel or PowerPoint that has printing capabilities and save them directly to your document management software. You can reorder or merge PDF files in order to create a book or compile data stored in different files. Docsvault’s PDF Printer allows converting all printable files to PDF, so you can use PDF, the international standard for electronic documents. Preserves all your documents in standard structure so that the content and appearance of your documents can’t be altered. Scan stacks of paper documents and convert them to searchable PDF documents. Make text PDF or scanned paper documents fully searchable with Optical Character Recognition. Slice, dice and assemble PDFs, annotate them with highlights, notes and custom stamps and edit text and images in PDFs.